My marriage almost ended. The daily stress and energy expended to advocate for and raise my active and unusual child on the autism spectrum led to complete exhaustion and meltdown. There was simply nothing left for anyone else, including my spouse. Hyper-focus on my son’s well-being, coupled with differences between my partner and me in our expectations for our child, led to severe domestic strife. My instinctive need to protect my son and consequently, a resentment of my husband, took us down a miserable path. It also didn’t help that in addition to the work life I was trying to maintain, I was largely responsible for managing the day to day needs of my son (getting to therapy appointments, finding programs, driving him to school, getting him dressed, feeding him, putting him to bed). Meanwhile, my husband felt neglected and undervalued, as he became the primary breadwinner, working long hours to support our family. When I told my therapist that we hadn’t been away from our child together for 10 years, he nearly choked. I would guess that you, reader, are not at all surprised. I saw little benefit to having a spouse, and no enjoyment in having to care for another human. This is not a sad story though. Fortunately, through open discussion, education, and therapy, we have developed a solid foundation that has deeper roots and more rewards than it ever would have if we hadn’t had a child with autism. We have become a team—a united front. We now look to each other for encouragement and support, not as another person making demands. We laugh and share stories throughout the day. We celebrate our son’s successes and hold each other tight through his struggles. This journey has made us stronger. So how did we go from one extreme to the other? 1. First, we acknowledged how bad things had gotten. Neither of us was happy, and in fact, we were becoming added stressors to each other’s already stressful life. But we were both committed to trying to make things work. 2. Once we let down our defenses, we began listening to each other as we shared our fears and frustrations. 3. We became more educated about our son’s needs and development and formed a unified plan of our expectations. This took talking with experts, other parents and reading up on parenting strategies. It took letting go of old habits and being willing to experiment with options not based on what was “right” but what worked. It took being flexible. 4. And then, we cultivated empathy—for ourselves, for our son, and for each other. This journey is hard for all of us, and while we want to always be at our best, we have compassion for one another when we struggle. And we struggle a lot. 5. We focused on self-care—making sure that we were getting the physical, emotional and social support we each needed—and just as importantly, giving each other the gift of time. 6. We sought support—for us, therapy helped us understand our struggles; family, friends and support groups (both online and community) can work well too. 7. We got respite—We made it a priority to make time for us as a couple. We found a babysitter and set up regular date nights. When we couldn’t find someone to watch our son, we made time each night for a favorite TV show, a yummy dinner, or a walk around the neighborhood. 8. We gave ourselves a break. People under stress lose patience, forget to be nice. There will be days that end in tears. But we will catch ourselves, apologize, and keep going. And that’s how we will make it. 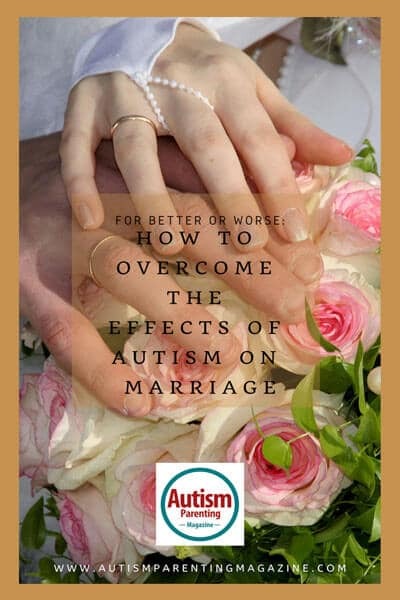 No one goes into a marriage expecting to have a child with autism, and even the most solid relationships can be flipped upside down due to the demands. While the divorce rate amongst couples with a child on the spectrum is slightly higher than those with typically developing kids, there is also evidence that those that survive have a strong, rich and deep connection with an unwavering bond that can’t be severed. I’m glad we are working toward the latter. Emily Daniels, MSW, RP, MEd is a psychotherapist and social worker in private practice in Fort Collins, CO who supports families with children with disabilities. Emily runs groups for young people on the spectrum and provides individual, sibling, parent and partner counseling using a strengths-based approach. In addition, Emily is the mother of a 10-year-old, super-enthusiastic boy on the autism spectrum.